Click the brain scans to view a color-coded chart describing changes in brain activation during the reading of a brief narrative. 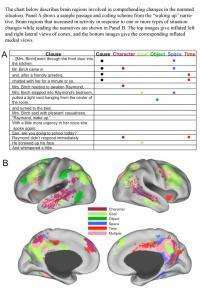 (PhysOrg.com) -- A new brain-imaging study is shedding light on what it means to "get lost" in a good book — suggesting that readers create vivid mental simulations of the sounds, sights, tastes and movements described in a textual narrative while simultaneously activating brain regions used to process similar experiences in real life. this is why the book of a story is usually so much better than the movie.